NOTE: if you are NOT in the United States, you need to select either Canada or International below based on where the book is to be sent. Want to use a US Check, US Money Order, or US Cash? Use this STTM II ORDER FORM 2016 See refund policy below. Want to order sets of BOTH the first revised STTM book and the new STTM II book? We have a page just for that! “By late 2013, I knew it was time to create a fork in the road. 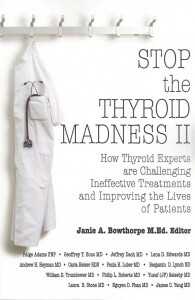 Up until then, my focus was on patient-to-patient experiences and wisdom about better thyroid treatment. Then it hit me: I’ve succeeded!! I have a huge website filled with valuable information, an active and growing Facebook group (where none of the Likes are “purchased”, the best-selling book on better thyroid treatment, and many patient-only groups which are connected to STTM. 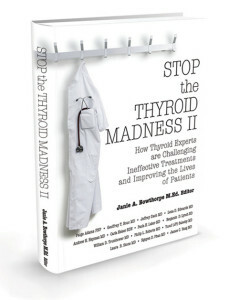 And now we have that very book: Stop the Thyroid Madness II. These authors weave their intelligences, wit, insight and courage into a second STTM book classic—one which will turn the medical establishment on its ears!